The Eastern Connecticut Sailing Association’s Leukemia Cup Regatta was held Friday, August 22 and Saturday, August 23 as a fundraiser for The Leukemia & Lymphoma Society (LLS). Hosted by North Cove Yacht Club in Old Saybrook, Duck Island Yacht Club in Westbrook and Brewer Pilots Point Marina in Westbrook, the weekend combined social and racing activities for all, including a Friday night cocktail party, potluck dinner and auction at North Cove YC. Exciting PHRF and one-design racing took place on Saturday, followed by a post-race party at Pilots Point Marina, with live music from Mid Life Crisis, great food from Saldamarco’s and awards from Lewmar Marine. This year’s Leukemia Cup Regatta weekend raised more than $70,000 for LLS and welcomed over 300 attendees. Friday night’s auction included a silent auction packed with donated items from local businesses, and the live auction featured two outstanding North Sails pros, Todd Berman and Jack Orr, who auctioned their sailing skills and advice to the highest bidder. Saturday was beautiful, with races run by the Duck Island YC race committee off Crane Reef. First gun was 1100, with five divisions including a Nonsuch 30 One-design class, three Non-Spinnaker and one Spinnaker class. The blustery northeasterly helped all the boats get off to a good start and around the top mark, then it faded as the mainland heated up, giving rise to a southerly seabreeze. One race was completed for classes 1, 2 and 3, with Mark Kondracky’s Pearson 26 Mentor winning the seven-boat Non-Spinnaker Class 1 by over 25 minutes corrected, with Peter Floyd’s Ranger 22 Reepicheep in second and Roy Guile’s Tartan 30 Kristina in third. Rich Glassman’s Sadler 34 Hot Fudge took Non-Spinnaker Class 2, with Robert Powers’ Plastrend PT-32 Tigger and Rick Hartman’s Tartan 34-2 Windward filling out the podium. The Nonsuch 30 Class was won by Bob Cornell’s Halcyon, with Joseph Carroll’s Judith Marie second and Dan Ferrier’s Stray Cat third. Classes 4 and 5 raced a five-mile course. In Class 4 (Non-Spinnaker), for race one, Mark Salerno’s Tripp 37 Fusion came in first, followed by Craig Schrauf’s C&C 115 Arirang and Chris Buydos’ J/30 Magan. In Class 5 (Spinnaker), for race one, owned by Kathy & Dave Nauber’s Frers 33 Wolverine captured first, Mark McCarthy’s Soverel 33 Sláinte finished second and Paul von Maffei’s Schock 35 Snow Bird came in third. After a major windshift/lunch delay, a second windward/leeward race was held for classes 4 and 5 in the building southerly. Both classes beat their way south to the edge of Long Sand shoal in a six- to 10-knot southerly, then ran north to a leeward mark off Waters Edge in Westbrook on a four-mile course. In the eight-boat Class 4, Magan won race two with Dave Gilmore’s Cal 33-2 Windshear second and Mike DeNamur’s Olson 911 SE Badger third. Overall, Magan won Class 4 followed by Fusion and Windshear. In Class 5, Wolverine locked up the weekend with a pair of bullets. Steven Marenkos’ J/105 Reckless was third in race two, but it was not enough to catch Sláinte who took fourth in race two and second overall. Lance Brown’s Wavelength 24 Scoots filled out the grab for silver with a second in race two and third overall. A surprise guest appearance at the post-race party by Gary Jobson, America’s Cup legend, TV commentator and Leukemia Cup National Chairman, wowed the racers and party guests. Jobson silenced the normally raucous crowd with his great gift for storytelling. In the final highlight of the evening, the 2014 Leukemia Cup Regatta honored skipper and cancer survivor Stephanie Weirsman, who shared her inspiring story of determination and hope to beat Hodgkin’s lymphoma. Prizes were awarded for first, second and third place in each class. 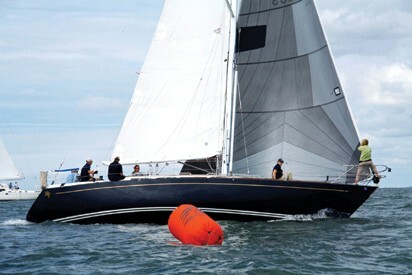 The perpetual Leukemia Cup Trophy was presented to Ruth & Peter Emblin’s Islander DP 40 Tartuca. Team Tartuca raised almost $9,000 for the LLS. This year, NCYC, DIYC and PPM surpassed the $500,000 fundraising mark for the LLS. At the post-race party, Gary Jobson announced that nationally, the Leukemia Cup Regatta has raised over $50 million, with 78% of all donations directly funding blood cancer research, education and support to help patients and their families manage through difficult times. I hope you feel as good as I do about helping The Leukemia & Lymphoma Society fight blood cancers. Together, Duck Island YC, North Cove YC, Brewer Pilots Point Marina and The Leukemia & Lymphoma Society are making a difference. I want to thank all the participants, fundraisers, volunteers, committee members and flag officers that helped during the Leukemia Cup Regatta this year and in years past. We had a great weekend and it was because of you! Together, we are saving lives, not someday but today.